Can Video Poker help me learn how to play Texas Hold ‘Em? The answer isn’t as simple as you’d think. Does video poker actively teach you how to play Texas Hold ‘Em? No. The video poker games themselves do not have detailed player tutorials that take you through each step as you play. While there are tutorials and guides that teach you the basic rules there are no actual play-by-play instructional videos that teach you strategy or how to make smart bets. Maybe one day you’ll login to Palace of Chance and find that we’ve added a Video Poker Texas Hold ‘Em Play and Learn Game. On the flip side, you CAN learn how to play Texas Hold ‘Em while playing video poker if you’re a fast learner who can pick up on rules and playing styles quickly. There are many online game players out there that can pull a chair up to the table (figuratively) and learn as they play. Is it suggested that you learn to play Texas Hold ‘Em from a video poker game? Sure, but be aware that there are differences between the video poker game and an actual game. You can win at video poker without the risk of other players cheating. Playing Texas Hold ‘Em at an actual table will involve some level of hesitation stemming from the fear of unscrupulous players looking to cheat you out of your money. Did this answer your question? Yes or no, you should still register and play a few of the fun, lucky games Palace of Chance has to offer. See you inside! The thing that JillnFrank love about video poker whether it helps you at hold em’ or not is the variation. 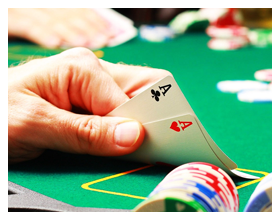 From Deuces to Jokers wild, Aces and Eights, Double Double Bonus, It’s all a variety for those who love to play poker! We love them all! However sitting and playing a Video poker machine might give you a basis on what the winning hands table is, but with hole cards, blinds, rounds of betting, and strategy it’s a very different game all together! Even though it says poker… Hold em’ poker and Video poker are about as similar as Futbol, and American Football But hey WE LOVE THEM BOTH! Would love the chance to go for that Royal Flush again today! Although I “know” how to play Texas Hold ‘Em I’m going to check out the Video Poker Texas Hold ‘Em Play and Learn Game. Thanks, Palace. Please give me instructions onhow to find this. I’ve looked at the site and cannot find it.